I have expectations for certain authors, because I know I'll get a specific set of results. With Stephanie Kuehn, I know that I'm going to read something wholly original, stealthily mind-bending, and deliciously disturbing. And that's just how I like it. Arman hates his life. No, I mean really hates it. He'd do anything to escape. So when he meets a self-help guru named Beau who runs a retreat outside of Big Sur, it seems like the solution to all of his problems. Beau gets him more than any other person. Beau is magnetic, with eyes like river stones and and an easy manner that makes you want to please him. Arman would do anything to make Beau proud of him. So he steals a couple grand from his drug-addict dad and runs away to catch the van to Beau's retreat. He leaves with two other teens, Dale and Kira. But aside from the three of them, there are very few people his age. There is the mysterious cook, whose relationship with Arman goes from culinary to carnal in a hot minute. And there are the many older participants of the retreat who already know the ropes, like the vaguely suspicious Dr. Gary, or Mari, whose outer pleasantness hides a quick temper. Over and over again, Arman feels like he is failing at the retreat. He's not open enough; he's not quiet enough; he's not honest enough. He's just plain not good enough. So he runs away. As it turns out, the retreat is quite a bit farther from the main highway than it seemed, and Beau ends up meeting him at a gas station. One minute they're talking, and the next minute, Beau's gone. Arman finds him in the van. What he sees precipitates a wild drive back to the retreat, where the van--and Beau--subsequently disappear. What is going on? What did Arman really see? What did he really do at the gas station? The residents of the retreat become more and more suspicious until an honest-to-goodness witch hunt begins. And Arman has to decide whether he's going to stand up for himself or not. Whether he trusts himself or not. Kuehn has, again, written a twisty little book that will leave your brain aching. But it's that sweet sort of ache that's pain and pleasure in one. 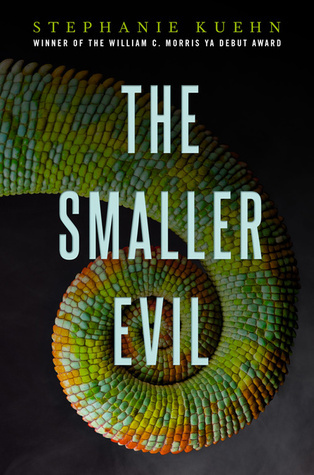 The Smaller Evil is a fascinating exploration of self-worth and worship, of the illusion of sanity and the illusion of insanity. Where do we draw the line? What determines what is real and what is false? Is it better--healthier, even--to accept the illusion instead of reality? This is not a tidy book with an ending that gives closure. Because life isn't like that. Not by a long shot. For a mind-twisting double-feature, pair this with A.S. King's absolutely brilliant I Crawl Through It. I've not done this book justice, and I am sorry for that. So I guess you'll just have to see how extraordinary it is yourself. I received an ARC of this title from the publisher, but the book is available now! Is it a cult? I'm currently reading a novel in which a girl with a tragic recent happening in her family is sucked into a cult. I think that the majority of readers would definitely identify it as a cult. What's really brilliant about the book is that at the end, you see why/how people with certain needs or issues don't recognize the danger of cultish behavior.